South Cowichan Rotary President Shirley Walker presents a $10,000 cheque to Michael Coleman, Kinsol Campaign member (centre) and Gerry Giles, Chair, CVRD. Duncan, BC – Wouldn’t it be cool to go down in history as the person who drove the Last Spike on the rehabilitated Kinsol Trestle? Well, that’s what members of the South Cowichan Rotary Club are offering the lucky grand prize winner of the Kinsol Trestle Lottery which runs until April 27. The Kinsol Trestle Lottery is part of a generous $50,000 cash and in-kind contribution the South Cowichan Rotary club is making to the Kinsol Trestle fundraising campaign. In addition to the proceeds from the lottery, Rotary is giving a cash donation of $10,000, which is money raised by the club with the support of major fundraising sponsor South Cowichan Eyecare over the last two years. 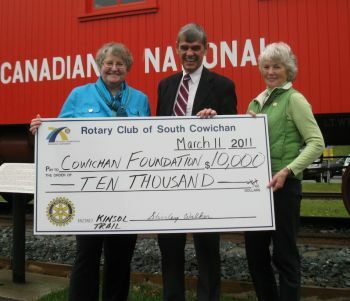 To round out their commitment, Rotary members from South Cowichan and Duncan clubs will supply their expertise and labour to source materials and help construct a trail on the north side of the Trestle. The 400 metre visitors’ trail will include three viewing platforms and will wind through the Trestle structure down to the Koksilah River, offering spectacular views of the Kinsol Trestle from several vantage points. The Kinsol Trestle Lottery gives ticket-holders a chance to drive the last spike into the Kinsol Trestle at the official reopening ceremonies planned for June. In addition, the lottery winner and three friends will be the first people to cross the new structure, spend a free night at the Whistle Stop B&B and enjoy lunch at the Merridale Estate Cidery. Second prize is a two day trip for two on the Rocky Mountaineer. Core rehabilitation work on the Trestle will wrap up at the end of March, but construction activities will continue on the site until the official reopening. Finishing work includes landscaping, the Rotary pathway, viewing platforms, heritage signage and donor recognition wall. Just over $200,000 remains to be raised from the local community to ensure that all the final project work is completed. If you would like to be part of this incredible project, donations can be made online at www.kinsol.ca, by calling 250-709-1087, or in person at 135 Third Street in Duncan. For more information about the Kinsol Trestle Lottery and for Rotary Lottery ticket information, please visit www.kinsoltrestlelottery.info or call John Thomas at 250-881-6351.